We’re now in the post-financial-crisis world—and that’s good news. It’s been about six years since the global economic meltdown, and workers across all industries are starting to get a clear view of how business looks on the other side. As the landscape comes into focus, banking executives are working to ensure their organizations and institutions are set up to succeed in this remade financial world. To do so, they must expertly handle new laws and regulations that seem to change every day. One thing is clear: banks and hedge funds will be scrutinized more closely than ever before. Moving forward, such institutions are calling on lawyers with technical and specialized financial expertise. Juan Azel is one such attorney. As senior legal regulatory counsel, he’s helping Standard Chartered Bank plot a new course to navigate these evolving rules. 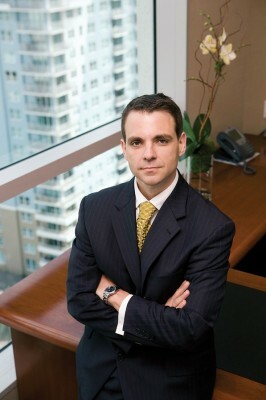 Azel is responsible for providing legal advice and support to the bank’s financial crime compliance (FCC) function in the Americas, which oversees the bank’s compliance with the Bank Secrecy Act (BSA), anti-money-laundering (AML) regulations, and sanctions regulations from the Office of Foreign Assets Control (OFAC). Azel is further responsible for providing legal support to the bank’s business in Latin America. From there, Azel took an opportunity to move to Greenberg Traurig, the largest and most prominent law firm in Miami, to work with some of the most prominent banking law experts in the country. Azel feels that Greenberg was where he grew into a banking and corporate lawyer. It was the dot-com era, which was an exciting and extremely busy time for transactional attorneys, Azel recalls. When several of the lawyers he worked with decided to leave Greenberg Traurig and go to another national law firm (Hunton & Williams), Azel went with them. While at Hunton & Williams, Azel came across the opportunity to take an in-house legal position with Spanish bank BBVA. “It was a dream come true,” Azel says of the move. “I was being given the opportunity to utilize my specialized expertise and continue my development as an integral part of my client’s business,” he explains. Azel believes any good lawyer—external or in-house—needs to have a deep understanding of his or her client’s business. That understanding happens best when the client is also the employer. “The easiest thing is to turn down a business proposal, but a good in-house lawyer identifies the risks involved, provides ways to mitigate them, and comes up with alternative ways of doing things to minimize those risks,” Azel says. When BBVA sold its private banking business in 2008, Azel seized the opportunity to move to Standard Chartered, which had recently purchased the private banking business of American Express Bank International. Standard Chartered, anchored by a UK headquarters, has 1,700 branches in 70 countries. In mid-2011, the bank decided to sell its Americas private banking business to Banco Santander, and as head of legal, Azel assisted the board of directors and handled all legal matters related to the large transaction. He even had a short stint as the interim CEO of the private bank in the Americas. The sale of the Americas private banking business helped Standard Chartered focus on its core markets of Africa, Asia, and the Middle East. Growing in those markets and in the Americas to become the world’s most reliable bank—Standard’s goal—requires the proper dissemination of changing regulations and effective compliance with those regulations. To assist the bank in this area, Azel was made senior legal regulatory counsel, responsible for all legal matters relating to the BSA, AML, and OFAC sanctions. Azel says new or revised regulations and sanctions are hitting the entire industry. “There is a bigger regulatory burden than ever before, and all financial institutions are having to dedicate more and more resources to making sure they comply,” he explains. As banks increase hiring in their legal and compliance departments, skilled and experienced banking lawyers as well as compliance personnel are becoming harder and harder to come by. These and other factors have led to a boom not only in legal and compliance personnel hiring, but also in the compliance consulting industry as temporary or third-party workers step in to provide financial institutions the resources and information they need to meet the increased regulatory burden. Banks and other institutions aiming to succeed in this post-financial-crisis world must adapt by increasing skilled and experienced resources and allocating more expenditures to legal and compliance. By the same token, in-house lawyers must also adapt. “I view each individual department of the bank as a client, and I have to make sure my team is up to speed in all of the latest laws and rules that could impact that client,” Azel says, adding that it’s no longer enough for a lawyer to know the BSA. He or she must learn to draft policy, procedures, and processes implementing the requirements of the act. Azel expects the focus on AML and sanctions to continue, and indeed, to increase even further. “Banking regulators are going to have more expectations for compliance, and banks simply need to grow and improve in this area to meet the coming challenges of operating in the real world,” he explains. In the meantime, Azel and his team will be hard at work to make sure Standard Chartered meets those challenges head-on.